Though I grew up where the Hudson Valley meets the Catskill Mountains, in the heart of Black Bear country, I can count my encounters with said bears on the fingers of one hand. In my young teenage years I was walking through the woods and was suddenly startled by a young bear dropping out of a tree only about five meters from me but before I could even react it was running away. In my later teenage years I saw a bear or a mother-and-cub pair three times when I was behind the wheel of my car. Mind you, every spring my parents learn it is time to take the bird feeders in at the house I grew up in because the bears, hungry after hibernation, destroy one or two, my aunt and uncle regularly have bears show up in their yard, and my brother has been known to go out on his porch and throw rocks to scare off a bear raiding his garbage can. But, somehow, I never had much luck with seeing bears. 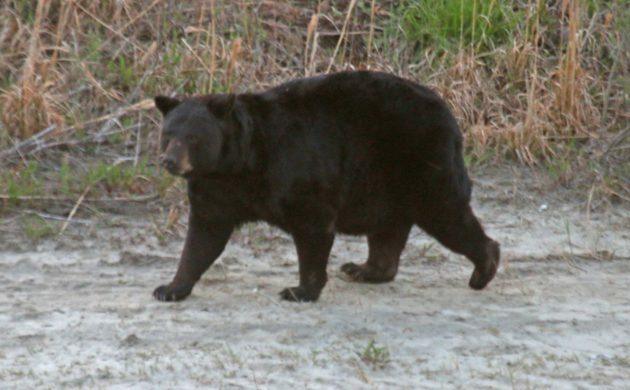 When I was reading up on Alligator River National Wildlife Refuge and realized that it is supposed to be the easiest place on the east coast to see Black Bears I was pretty excited. There’s an wildlife drive that allows you to explore large chunks of the refuge by car looking for bears (and, of course, birds). I got out there early on the morning of 5 April and turned onto the dirt road that would lead to the wildlife drive…and realized that Google maps had been misleading and what I thought was a route into the refuge was actually a road that led to a landfill of some kind. I was trying to get a signal on my phone to pull up a map and figure out a way to where I wanted to go when I looked up and saw a very large bear walk in front of my car. As I scrambled to get my binoculars and camera out of my back pack the bear continued past, swam the deep ditch next to the road, and continued into the woods. I didn’t even have time to be bummed out about missing a photo or even a binocular look before and even bigger bear walked out in front of the car! The pre-sunrise light was lousy but the looks at this behemoth were amazing! With the window down I could hear it snuffling at the ground occasionally before following the first bear across the ditch into the woods. No more bears showed up so I drove up a rather dicey dirt road up onto a berm from where I could see a third bear off in the distance, heading away from the landfill in another direction. 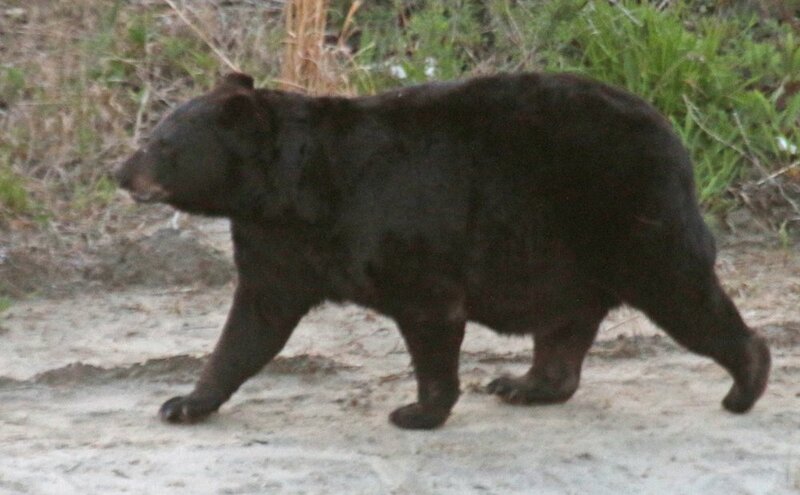 No sooner had I noticed that bear than I noticed a fourth, this one down below the berm and much closer! This is the same bear that is up at the top of the post. This one I got to watch for awhile as it slowly walked along without a care in the world. It’s kind of amazing to see such a large creature move so smoothly. You’d think something that big would be clumsy, or at least I would, but this bear moved with grace. 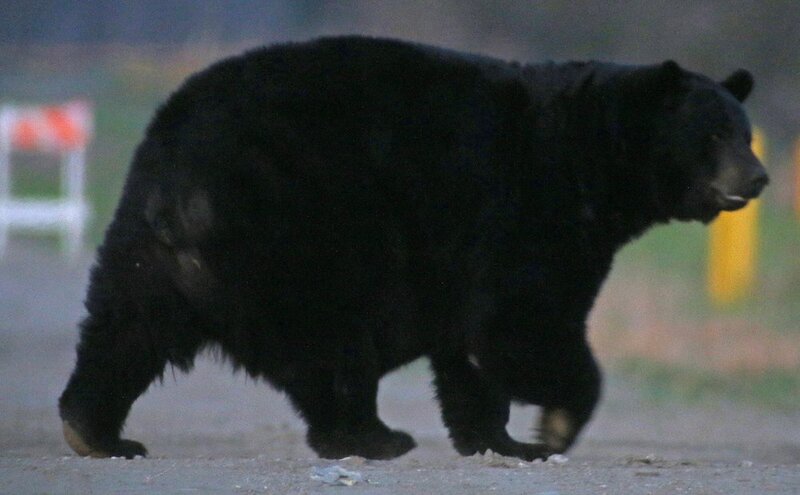 I would not want to meet this bear in a dark alley. It looked to me like this bear was heading to the same location as the first two, so I drove back off the berm and waited…and waited…and waited. But the bear never showed up. And I couldn’t find it again. How something so large gave me the slip in pretty open terrain is a puzzler but bears are pretty clever creatures when they want to be. 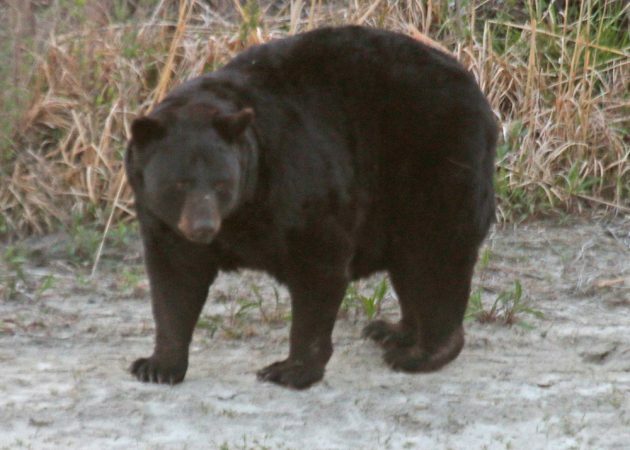 After my predawn encounter with the four bears I spent the next two-and-a-half hours birding in Alligator River National Wildlife Refuge proper without seeing a single bear. Turned out that turning into the dump was the best move I made all day! Where Are You Birding This Second Weekend of April 2018?